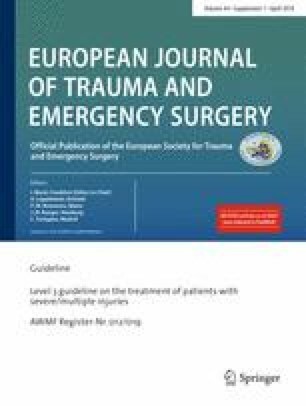 In 2014, the German Trauma Society initiated the update of the “Clinical Practice Guideline on the Treatment of the Severely Injured”, representing an extensive revision after the initial guideline published in 2012 . The aim of the guideline is to provide the latest evidence on the management of the severely injured patient and to improve the outcome of trauma patients. The guideline was established in an extensive process over 2 years with the support of 20 medical societies involved in the treatment of severely injured patients and published in German language in summer 2016 . The guideline was developed according to the methodology defined by the Board of Medical Societies (AWMF, Association of the Scientific Medical Societies in Germany, which affiliates 175 Scientific Societies from all specialties of medicine in Germany). This S3 guideline fulfills the highest level of standard of this organization . The guideline is evidence based, was consented by the representatives of all participating medical societies and is now translated into English in 2018 in this issue  to provide guidance to the international trauma care community. The actual guideline provides 264 key recommendations for the management of the severely injured patient in three different phases: prehospital management (66 key recommendations), emergency room management (102 key recommendations), early operative management (96 key recommendations). During the first consensus meeting, all chapters of the first “Clinical Practice Guideline on the Treatment of the Severely Injured” published in 2012 were reviewed with respect to relevance, new evidence and additional chapters. Lead authors were assigned to each chapter. A systematic literature search was then performed with professional support. The key recommendations for each chapter were phrased and consented by the majority of delegates of the 20 medical societies. All key recommendations and the underlying evidence are further discussed in the following text. The English version of the guideline is now available as “free access” to all those interested in the management of the severely injured . We encourage all those involved in the management and research of trauma patients to use the guideline extensively, first to get knowledge of the extensive review, and second to challenge the key recommendations. If readers are aware of new evidence in that field, we would be happy to receive feedback. AWMF (2016) S3-Leitlinie Polytrauma/Schwerverletzten-Behandlung (AWMF Register-Nr. 012/019) 01.07.2016. http://www.awmf.org/leitlinien/detail/ll/012-019.html.